The long awaited holiday season comes but once a year so it’s only right that you take advantage of the festive and seasonal activities that come along with it. During the holiday season the city comes alive with displays, events, and attractions to explore that will put even the grinchiest in a joyous mood. Below are some of Toronto’s most magical events that are a must-see while visiting the city during the holidays. Is the holidays even the holidays without a visit to Toronto’s Christmas Market? This annual event turns the cobblestoned streets of Toronto’s charming distillery district into a European-style winter wonderland from November 16 to December 23. No matter your style or flavour, you’ll be able to find an array of merry treats and trinkets amongst the glittery decorated vendors, food stations, and crafts shops waiting for you to explore. Once you’ve paid Santa a visit, guests can enjoy seasonal cocktails and beers at the Christmas Market Beer Garden, before singing along to traditional Christmas carols with cheery musicians. Embrace the magical holiday celebrations for free from Tuesday to Friday or for a $6.00 admission fee on weekends. It will be hard to ignore the city’s most scenic rink this holiday season at Toronto’s Harbourfront Centre. Set along Lake Ontario, this rink’s inviting festive atmosphere is not to be missed either by day or by night. The Natrel Rink is open daily, offering free admission and reasonably priced skate and helmet rentals. Heated indoor change rooms make it easy and comfortable to partake in the holiday action, while the Boxcar Social rink-side restaurant offers a changing list of coffees and creative seasonal menu items to keep you warm. For a more musical experience, head down to the harbourfront for one of their Saturday DJ Skate Nights. Toronto’s gothic style Casa Loma takes holiday magic to the next level during the holiday season. Celebrate 150 years of Canadian Christmas from December 2nd to January 7th on the castle grounds with a variety of jolly activities to explore. Casa Loma becomes a sight to see with festive Christmas lights twinkling throughout, and holiday decor to spark your wonder. Take a picture with the grandiose 40 foot Christmas tree in Casa Loma’s Great Hall, before basking in holiday merriment with exciting performances including illusionists and professional ice-skaters. Canadian Winterland Nights take place nightly from 5 to 9 p.m., where guests can watch holiday spectacles against the night sky. If you missed the annual holiday kick-off and tree-lighting event at Nathan Phillips Square in November, no need to be disappointed. Toronto allows its holiday lights to shimmer throughout the holiday months to keep things festive all season long. Start your holiday decor tour at Nathan Phillips Square to spot Toronto’s impressive official Christmas tree before heading down to Bloore-Yorkville’s Mink Mile to see stunning and original light displays by shops that line the street. The Gardiner Museum (steps from the Yorkville Residence suites) combines Christmas decorations and high fashion with Christmas trees on display decorated by top designers including Hermés and Michael Adamson. For a more natural display, Winter Lights at the Rock at the Royal Botanical Gardens has a 1 kilometre walkway combining Christmas magic and Canadian history. It’s never too early to get your Christmas list out of the way. Grab a warm hot chocolate and venture into merriment at the Toronto Eaton Centre (close to University Plaza furnished apartments). If the mall’s 50 foot Christmas tree isn’t inspiring enough, Christmas gift ideas will be displayed throughout the mall to spark your holiday imagination. 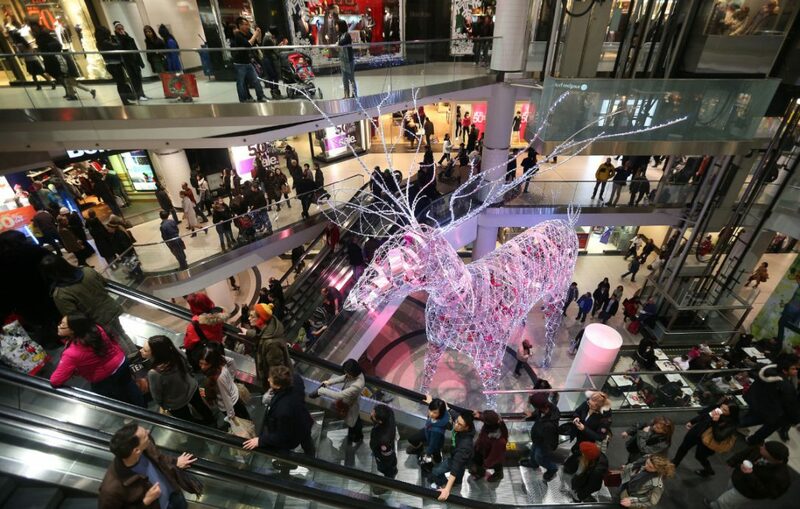 This iconic Toronto landmark has over 200 stores to explore with twinkling decorations to add a bit of holiday cheer to your shopping. If it’s hip and trendy gifts you’re after, the fashionable Queen West district is the place to be. Rummage through vintage shops for unique finds or head into indie favourites to give your loved ones the gift of style. Don’t expect the artistic and vibrant Kensington market to go to sleep for the holidays. Along with a variety of seasonal items that are great for gift-giving, this eclectic area offers a day of culinary exploration on their weekend market crawl. This is the perfect time to taste and experience an array of flavours that can be introduced to your loved ones for Christmas dinner! Get inspired through 8 very different tastings from Mexican to Italian while learning about the history and culture of one of Toronto’s most famed markets. Vegetarians need not worry, as substitutions can be made for non-meat eaters. The holiday season is an ideal time to beat the winter blues and explore what the city of Toronto has to offer. Whether you’re after trendy boutiques, delicious eats, or just want to pay a visit to Santa, this city has you covered. Be sure to take advantage before the holiday magic disappears.